Back issues of Vanity Fair are as enjoyable to page through today as they were at the time of original publication. Oversized and perfect bound with slick pages filled with black and white photographs and colorful paintings, with text from the likes of Dorothy Parker, Robert Benchley, D.H. Lawrence and so many more, every page is an adventure into the history of early twentieth century American culture. Publisher of Vogue Conde Nast had purchased a competitive title called Dress which he would couple with another purchase titled Vanity Fair. This had been a British publication which Nast had paid $3,000 for in 1913. Nast combined his two purchases into Dress and Vanity Fair that same year, and quickly realized that his new publication was a failure after just four issues. He happened upon Frank Crowninshield who would become editor with the fifth issue of the retitled Vanity Fair, a post he would hold until the magazine’s 1936 demise. “My interest in society–at times so pronounced that the word ‘snob’ comes a little to mind–derives from the fact that I like an immense number of things which society, money, and position bring in their train: paintings, tapestries, rare books, smart dresses, dances, gardens, country houses, correct cuisine, and pretty women” (Tebbel 257). 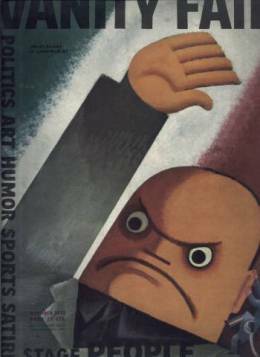 Americans would come to learn of Picasso, Matisse and Gauguin through the pages of Vanity Fair, they would read Dorothy Parker, enjoy the photography of Edward Steichen and the humourous yet eerie caricatures of Miguel Covarrubias. A complete history, as well as a more complete listing of its contributors over the years, can be found on Vanity Fair’s own site in the article The One-Click History. 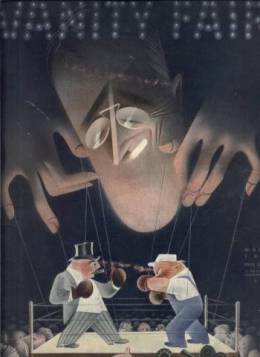 Vanity Fair would cover art, theater, literature, sport, film for the “smart” crowd, an elite audience which would stifle its circulation and ultimately suffocate the publication when the world turned dark under the cloud of the Depression and coming War in the 1930’s. Competition in its hey day came from H.L. Mencken’s Smart Set and American Mercury as well as Harold Ross’s New Yorker. It’s layout was precursor to the coming photojournalistic publications beginning with LIFE Magazine. And it’s death was not permanent as it was successfully revived in 1983 and continues to be published today. But as the busy covers shown on this page illustrate, the Vanity Fair of Conde Nast and Frank Crowninshield was a true original, consisting of Crowninshield’s vision and the contributions of a host of artistic giants, the likes of which no budget could bring together today for successful replication. Each vintage issue is to be treasured, and so they are as copies are not so easily found by the collector. Even with a circulation of just 85,000-99,000 at its height, issues were surely saved and treasured by its audience, but at the same time it’s been 70 years since Vanity Fair’s 1936 merge into Vogue, and so time has taken its toll upon the population of available issues. Collectible issues without especially notable contents are sold for $20-$40 depending upon condition with more valuable and especially coveted issues being those containing portraits by Man Ray, Edward Steichen, writing by Dorothy Parker, e.e. cummings, Ernest Hemingway, and covers by Covarrubias. Quite honestly though each issue of Vanity Fair that I have seen does boast some and often multiple reasons to be collected.
. Urbana: The University of Illinois Press, 1956. Tebbel, John and Mary Ellen Zuckerman. The Magazine in America, 1741-1990 . New York, Oxford University Press: 1991.